"Spanish Republic" redirects here. For Spain from 1873 to 1874, see First Spanish Republic. The Spanish Republic (Spanish: República Española), commonly known as the Second Spanish Republic (Spanish: Segunda República Española), was the democratic government that existed in Spain from 1931 to 1939. The Republic was proclaimed on 14 April 1931, after the deposition of Alfonso XIII, and it lost the Spanish Civil War on 1 April 1939 to the rebel faction, that would establish a military dictatorship under the rule of Francisco Franco. a. Espainiako Errepublika in Basque, República Espanyola in Catalan and República Espanhola or "República Española" in Galician. b. Catalan, Basque and Galician would gain formal officiality with the approval of the Statute of Autonomy. After the proclamation of the Republic, a provisional government was established until December 1931, when the 1931 Constitution was approved a Constitutional Republic was formally established. The republican government of Manuel Azaña would start a great number of reforms to "modernize" the country. After the 1933 general election, Alejandro Lerroux (Radical Party) formed a government with the confidence and supply of the Spanish Confederation of Autonomous Right-wing Groups (CEDA). Under Lerroux's premiership, the Republic found itself before an insurrection of anarchists and socialists that took a revolutionary undertone in Asturias. The revolt was finally suppressed by the Republic with the intervention of the army. The Popular Front won the 1936 general election. On 17–18 July 1936, a coup d'état fractured the Spanish Republican Armed Forces and partially failed, marking the beginning of the Spanish Civil War. During the Spanish Civil War, there were three governments. The first was led by left-wing republican José Giral (from July to September 1936); however, a revolution inspired mostly on libertarian socialist, anarchist and communist principles broke within the Republic, which weakened the rule of the Republic. The second government was led by socialist Francisco Largo Caballero of the trade union General Union of Workers (UGT). The UGT, along with the Confederación Nacional del Trabajo (CNT), were the main forces behind the aforementioned social revolution. The third government was led by socialist Juan Negrín, who led the Republic until the military coup of Segismundo Casado, which ended republican resistance and led, ultimately, to the victory of the nationalists, who would establish a military dictatorship under the rule of Francisco Franco, known as Francoist Spain. The Republican government survived in exile, and it had an embassy in Mexico City until 1976. After the restoration of democracy in Spain, the government formally dissolved the following year. On 28 January 1930 the military dictatorship of General Miguel Primo de Rivera (who had been in power since September 1923) was overthrown. This led various republican factions from a wide variety of backgrounds (including old conservatives, socialists and Catalan nationalists) to join forces. The Pact of San Sebastián was the key to the transition from monarchy to republic. Republicans of all tendencies were committed to the Pact of San Sebastian in overthrowing the monarchy and establishing a republic. The restoration of the royal Bourbons was rejected by large sectors of the populace who vehemently opposed the King. The pact, signed by representatives of the main Republican forces, allowed a joint anti-monarchy political campaign. The 12 April 1931 municipal elections led to a landslide victory for republicans. Two days later, the Second Republic was proclaimed, and King Alfonso XIII went into exile. The king's departure led to a provisional government of the young republic under Niceto Alcalá-Zamora. Catholic churches and establishments in cities like Madrid and Sevilla were set ablaze on 11 May. In June 1931 a Constituent Cortes was elected to draft a new constitution, which came into force in December. The new constitution established freedom of speech and freedom of association, extended suffrage to women in 1933, allowed divorce, and stripped the Spanish nobility of any special legal status. It also effectively disestablished the Roman Catholic Church, but the disestablishment was somewhat reversed by the Cortes that same year. Its controversial articles 26 and 27 imposed stringent controls on Church property and barred religious orders from the ranks of educators. Scholars have described the constitution as hostile to religion, with one scholar characterising it as one of the most hostile of the 20th century. José Ortega y Gasset stated, "the article in which the Constitution legislates the actions of the Church seems highly improper to me." Pope Pius XI condemned the Spanish government's deprivation of the civil liberties of Catholics in the encyclical Dilectissima Nobis. The legislative branch was changed to a single chamber called the Congress of Deputies. The constitution established legal procedures for the nationalisation of public services and land, banks, and railways. The constitution provided generally accorded civil liberties and representation. Catholic churches in major cities were again subject to arson in 1932, and a revolutionary strike action was seen in Málaga the same year. A Catholic church in Zaragoza was burnt down in 1933, and the cathedral in Oviedo was destroyed by flames in 1934. The church of San Lorenzo in Gijon was also set ablaze in the same year. The church of San Juan in Albacete was torched three months prior to the onset of the civil war, in March 1936. The 1931 Constitution was formally effective from 1931 until 1939. In the summer of 1936, after the outbreak of the Spanish Civil War, it became largely irrelevant after the authority of the Republic was superseded in many places by revolutionary socialists and anarchists on one side, and fascists on the other. The Republican Constitution also changed the country's national symbols. The Himno de Riego was established as the national anthem, and the Tricolor, with three horizontal red-yellow-purple fields, became the new flag of Spain. Under the new Constitution, all of Spain's regions had the right to autonomy. Catalonia (1932), the Basque Country (1936) and Galicia (although the Galician Statute of Autonomy couldn't come into effect due to the war) exercised this right, with Aragon, Andalusia and Valencia, engaged in negotiations with the government before the outbreak of the Civil War. The Constitution guaranteed a wide range of civil liberties, but it opposed key beliefs of the conservative right, which was very rooted in rural areas, and desires of the hierarchy of the Roman Catholic Church, which was stripped of schools and public subsidies. See also: Background of the Spanish Civil War § The "two black years"
The majority vote in the 1933 elections was won by the Spanish Confederation of the Autonomous Right (CEDA). José María Gil Robles, their leader, led a coalition of centre-right and far-right parties: CEDA set up a coalition with the Radical Republican Party led by Alejandro Lerroux, which had come second in the elections. The Socialists came third. With Lerroux as head of Government, the new coalition suspended most of the reforms carried out by the last government. The inclusion of three CEDA ministers in the government that took office on 1 October 1934 led to a general strike and a rebellion by socialists and anarchists in Asturias on 6 October. Miners in Asturias occupied the capital, Oviedo, killing officials and clergymen, and burning theatres and the university. This rebellion lasted for two weeks until it was crushed by the army, led by General Francisco Franco, who, in the process, destroyed large parts of the city. This operation earned Franco the nickname "Butcher of Asturias". Another rebellion by the autonomous government of Catalonia, led by its president Lluís Companys, was also suppressed and was followed by mass arrests and trials. The suspension of the land reforms that had been attempted by the previous government, and the failure of the Asturias miners' uprising, led to a more radical turn by the parties of the left, especially in the PSOE (Socialist Party), where the moderate Indalecio Prieto lost ground to Francisco Largo Caballero, who advocated a socialist revolution. At the same time, the involvement of the Centrist government party in the Straperlo scandal deeply weakened it, further polarising political differences between right and left. These differences became evident in the 1936 elections. On 7 January 1936, new elections were called. Despite significant rivalries and disagreements, the socialists, Communists, and the Catalan-and-Madrid-based left-wing Republicans decided to work together under the name Popular Front. The Popular Front won the election on 16 February with 263 MPs against 156 right-wing MPs, grouped within a coalition of the National Front with CEDA, Carlists, and Monarchists. The moderate centre parties virtually disappeared; between the elections, Lerroux's group fell from the 104 representatives it had in 1934 to just 9. In the following months, there was increasing violence between left and right. This helped the development of the fascist-inspired Falange Española, a National party led by José Antonio Primo de Rivera, the son of the former dictator, Miguel Primo de Rivera. Although it only received 0.7 percent of the votes in the election, by July 1936 the Falange had 40,000 members. On 12 July 1936, Lieutenant José Castillo, an important member of the anti-fascist military organisation Unión Militar Republicana Antifascista (UMRA), was shot by Falangist gunmen. In response a group of Guardia de Asalto and other leftist militiamen led by Civil Guard Fernando Condés went to right-wing opposition leader José Calvo Sotelo's house in the early hours of 13 July on a revenge mission. Sotelo was arrested and later shot dead in a police truck. His body was dropped at the entrance of one of the city's cemeteries. According to all later investigations, the perpetrator of the murder was a socialist gunman, Luis Cuenca, who was known as the bodyguard of PSOE leader Indalecio Prieto. Calvo Sotelo was one of the most prominent Spanish monarchists who, describing the government's actions as Bolshevist and anarchist, had been exhorting the army to intervene, declaring that Spanish soldiers would save the country from communism if "there are no politicians capable of doing so". Prominent rightists blamed the government for Calvo Sotelo's assassination. They claimed that the authorities did not properly investigate it and promoted those involved in the murder whilst censoring those who cried out about it and shutting down the headquarters of right-wing parties and arresting right-wing party members, often on "flimsy charges". The event is often considered the catalyst for the further political polarisation that ensued, the Falange and other right-wing individuals, including Juan de la Cierva, had already been conspiring to launch a military coup d'état against the government, to be led by senior army officers. Stanley Payne claims the idea of a rebellion by army officers against the government had weakened before these events, but the kidnapping and murder of Calvo Sotelo had an electrifying effect which provided a catalyst to transform what was a "limping conspiracy" to a powerful revolt that could set off a civil war.". The involvement of forces of public order in the plot and a lack of punishment or action against the attackers hurt public opinion of the government. No effective action was taken, Payne points towards possible veto by socialists within the government who shielded the killers who had been drawn from their ranks. Within hours of learning of the murder and the reaction Franco changed his mind on rebellion and dispatched a message to Mola to display his firm commitment. When the antifascist Castillo and the anti-socialist Calvo Sotelo were buried on the same day in the same Madrid cemetery, fighting between the Police Assault Guard and fascist militias broke out in the surrounding streets, resulting in four more deaths. 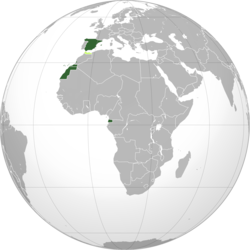 Three days later (17 July), the coup d'état began more or less as it had been planned, with an army uprising in Spanish Morocco, which then spread to several regions of the country. Franco's move was intended to seize power immediately, but his army uprising met with serious resistance, and great swathes of Spain, including most of the main cities, remained loyal to the Republic of Spain. The leaders of the treason (Franco was not commander-in-chief yet) did not lose heart with the stalemate and apparent failure of the coup. Instead, they initiated a slow and determined war of attrition against the Republican government in Madrid. As a result, an estimated total of half a million people would lose their lives in the war that followed; the number of casualties is actually disputed as some have suggested as many as a million people died. Over the years, historians kept lowering the death figures and modern research concluded that 500,000 deaths were the correct figure. "Los Cuatro Generales" and "Viva La Quince Brigada"
Two folk songs from the Spanish Civil War sung by Leon Lishner. The Second Republic was proclaimed during a period of worldwide economic depression. In spite of the high hopes, the Republican authorities had to struggle with rising unemployment and poverty. In the ensuing civil unrest, violence in the form of assassination, revolutionary general strikes, and mob actions increased to dangerous levels in the eyes of the traditional centres of power, such as the landowners, the Church, and the nobility. Thus, it was easy for them to whip up dissatisfaction with the republican government. Poster displayed in Museu Nacional d'Art de Catalunya. The murders of the leftist military leader José Castillo and the rightist politician José Calvo Sotelo opened the way to a rapidly increasing flood of violence between the political left and right. Rightists in Spain justified their military coup against the Republic claiming that it was ungovernable and failed to respond adequately to the threats of communism, anarchism, anti-clericalism, and acts of random violence. As well as this growth in extreme-left violence, the attitude of the Republican elite was perceived as permissive to the secessionist politics of the wealthy industrial regions of Catalonia and the Basque Country, which were felt by Spanish nationalists to pose a threat to the very existence of Spain as a nation-state. Twenty-six republicans that were assassinated by fascists who belonged to Franco's Nationalists side at the beginning of the Spanish Civil War, between August and September 1936. 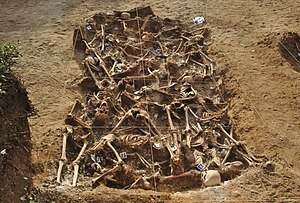 This mass grave is placed at the small town named Estépar, in Burgos, northern Spain. The excavation occurred in July–August 2014. 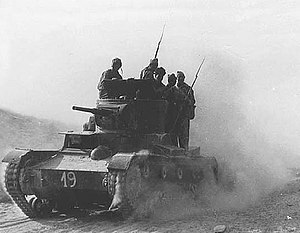 On 17 July 1936, General Franco led the Spanish Army of Africa from Morocco to attack the mainland, while another force from the north under General Emilio Mola moved south from Navarre. Military units were also mobilised elsewhere to take over government institutions. Before long the professional Army of Africa had much of the south and west under the control of the rebels. Bloody purges followed in each piece of captured "Nationalist" territory in order to consolidate Franco's future regime. Although both sides received foreign military aid, the help that Fascist Italy, Nazi Germany (as part of German involvement in the Spanish Civil War), and neighbouring Portugal gave the rebels was much greater and more effective than the assistance that the Republicans received from the USSR, Mexico, and volunteers of the International Brigades. While the Axis powers wholeheartedly assisted General Franco's military campaign, the governments of France, Britain, and other European powers looked the other way and let the Republican forces die, as the actions of the Non-Intervention Committee would show. Imposed in the name of neutrality, the international isolation of the Spanish Republic ended up favouring the interests of the future Axis Powers. The Siege of the Alcázar at Toledo early in the war was a turning point, with the rebels winning after a long siege. The Republicans managed to hold out in Madrid, despite a Nationalist assault in November 1936, and frustrated subsequent offensives against the capital at Jarama and Guadalajara in 1937. Soon, though, the rebels began to erode their territory, starving Madrid and making inroads into the east. The north, including the Basque country, fell in late 1937, and the Aragon front collapsed shortly afterward. The bombing of Guernica was probably the most infamous event of the war and inspired Picasso's painting. It was used as a testing ground for the German Luftwaffe's Condor Legion. The Battle of the Ebro in July–November 1938 was the final desperate attempt by the Republicans to turn the tide. When this failed and Barcelona fell to the rebels in early 1939, it was clear the war was over. The remaining Republican fronts collapsed, and Madrid fell in March 1939. ^ Payne, Stanley G. (1993) Spain's First Democracy: The Second Republic, 1931–1936, pp. 62–3. Univ of Wisconsin Press. Google Books. Retrieved 2 October 2013. ^ Payne, Stanley G. (1973). "A History of Spain and Portugal (Print Edition)". University of Wisconsin Press. Library of Iberian resources online. 2, Ch. 25: 632. Retrieved 30 May 2007. ^ Payne, Stanley G. (1973). "A History of Spain and Portugal (Print Edition)". University of Wisconsin Press. Library of Iberian resources online. 2, Ch. 26: 646–47. Retrieved 15 May 2007. ^ "Uneasy path". Evening Post, Volume CXXI, Issue 85, 9 April 1936. National Library of New Zealand. Retrieved 24 October 2013. ^ a b G., Payne, Stanley. The Spanish Civil War. New York. ISBN 9781107002265. OCLC 782994187. ^ a b Imperial War Museum (2002). "The Spanish Civil War exhibition: Mainline text" (PDF). Archived from the original (PDF) on 11 December 2013. Retrieved 27 April 2013. ^ Thomas Barria-Norton, The Spanish Civil War (2001), pp. xviii & 899–901, inclusive. ^ Helen Graham, among others. Beevor, Antony (2006). The Battle for Spain: The Spanish Civil War 1936–1939. New York: Penguin Books. Casanova, Julián (2010). The Spanish Republic and Civil War. Cambridge, UK: Cambridge University Press. doi:10.1017/CBO9780511763137. ISBN 0-521-49388-9. Henry Buckley, The Life and Death of the Spanish Republic: a Witness to the Spanish Civil War, IB Tauris, (1940, rep 2013). First Edition almost entirely destroyed and not reprinted until 2013. Helen Graham (2003). The Spanish Republic at War 1936-1939. Cambridge University Press. ISBN 978-0521459327. Wikimedia Commons has media related to Second Spanish Republic. Original article from the beginning of the Spanish Civil War in The Guardian's archives.